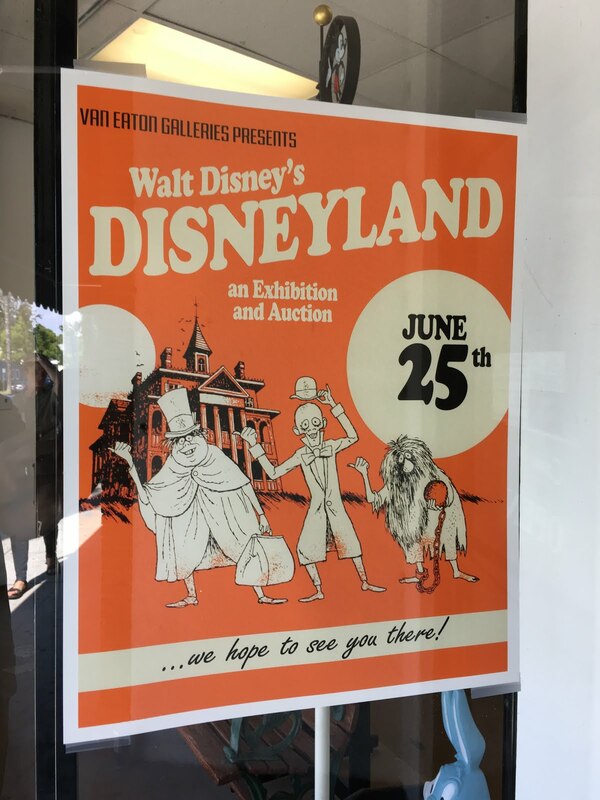 Van Eaton Galleries, located in Sherman Oaks in Los Angeles' San Fernando Valley, recently held an auction of Disneyland related memorabilia. My wife, kids and I were in Southern California for a family vacation a couple of weeks before the auction. I had heard about the it - and I wanted to stop by the gallery, just to see what was going to be available. Plus, we were planning on going to Disneyland at the end of the week, so why not make this our first stop. 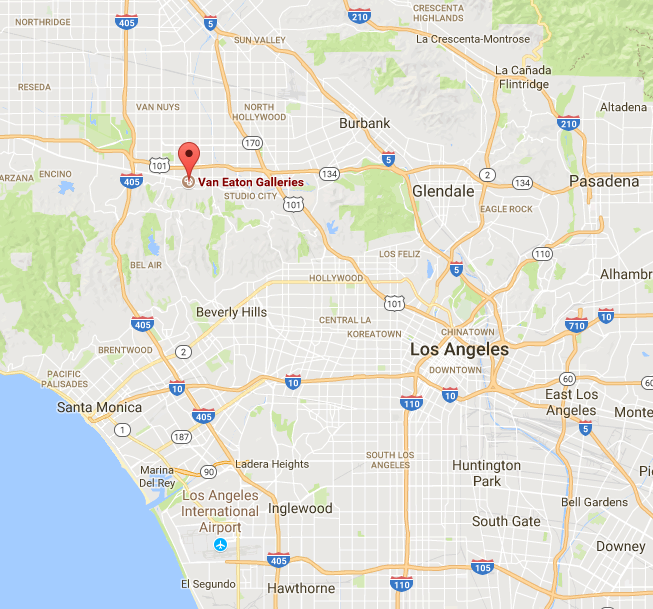 Van Eaton Galleries is located on 13613 Ventura Blvd in Sherman Oaks. Ventura Blvd feels like the Wilshire (or Sunset) Blvd of the Valley, paralleling the Venture Freeway (the 101) - from Studio City in the east to Woodland Hills in the west. This is looking west. With a break in the traffic, as we crossed the street. Like much of the San Fernando Valley, the majority of Ventura Blvd is made up of one and two story commercial buildings. Van Eaton Galleries normally specializes in animation art. With Disney, Warner Brothers, Hannah Barbera (now The Cartoon Network) located close by it makes sense. They have been recently been adding in Disneyland memorabilia, with special auctions a couple times a year. A poster advertising the auction featuring artwork from Walt Disney's Tiki Room. We were at the right place. Mid century flagstone. Walk on in. The walls were literally covered with dozens of artifacts and memorabilia from Disneyland. My wife and daughter looking inside one of the display cases. Want to buy the Tiki from the Tiki Room? It's an original cast resin from the pre-show and was estimated to go for $5000-$7000. If that's a little too steep, you might want to try the replica of the "barker bird" from the show, going from between $700-$900. Or, try the single page lunch menu from the old Tahitian Terrace restaurant for $200-$300. 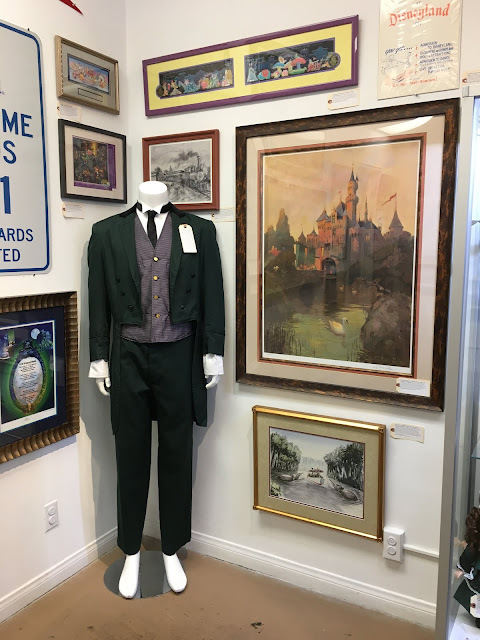 Want to own a copy of the Haunted Mansion costume? That was estimated to go for between $1000-$2000. 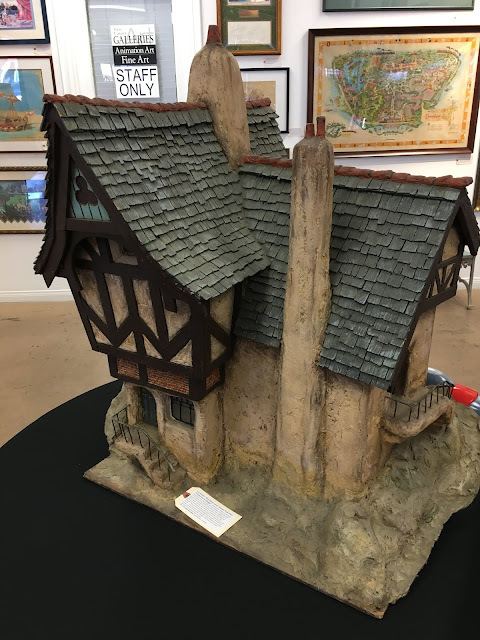 One of the props from the Cinderella's Village section of Storybook Land Canal Boat Ride was estimated to go from between $12,000-$15,000. If you look at this as artwork (rather than just a discarded prop) I suppose you could justify the price. Here's more information on this Storybook Land Canal Boat Ride item. A personal favorite was the sketch for Main Street USA, when the original concept drawings included both commercial and residential buildings. The residential buildings were never actually included on Main Street. More info on the Main Street concept art. More info on the map. The Matterhorn, is pictured a small hill. Even as early as 1958, there were future plans for a "New Orleans Square" featuring a "Haunted House." Plans also called for never build lands of "Liberty Street" and "Edison Square" - both off of Main Street USA. In the next room were more items for auction, including "The Map." "The Map" was the most talked about - and most expensive item - in the entire auction. This was the original map created by Walk Disney and imagineer Herb Ryman in 1953, and was used by Walt's brother Roy to secure funding from ABC to pay for Disneyland. This was the single most significant item the gallery. Here's a link with more info. The opening bid was $500,000, with the The Map selling on the June 25th auction for $600,000. My wife and kids next to "The Map". They also had a copy of the original Disneyland blueprint. While Disneyland has grown and expanded over the years, many of the original buildings, including Main Street USA and Sleeping Beauty Castle, have stayed the same. This was estimated to go between $12,000-$15,000. 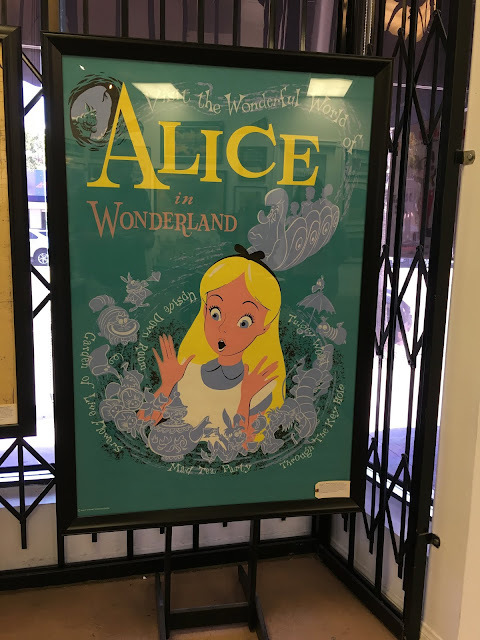 This 1958 publicity poster for the then new Alice in Wonderland attraction was estimated between $2000-$3000. Certainly one of the most interesting items was a group of 100 photos, plus 2000 feet of never be seen video footage, of the"Yippie Invasion." During the height of the Vietnam War Protests, several hundred "yippies" (politically active hippies) invaded Disneyland on August 6, 1970 - causing the police and sheriff's department to be called out and the park closed early. Not sure who would want to by this - but, if so, it's estimated between $3000-$5000. 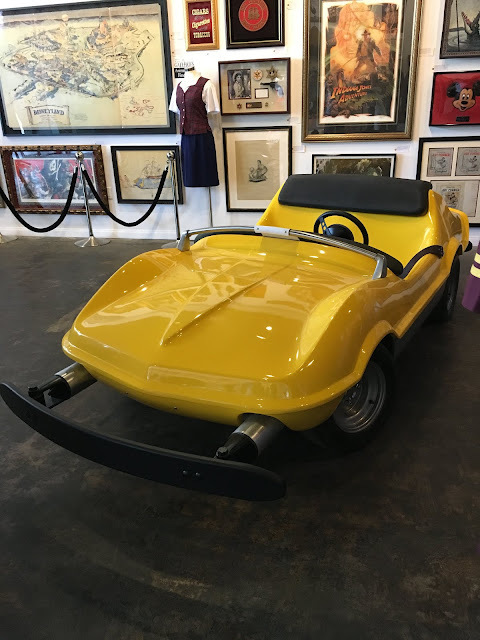 Not sure where you'd put this, but if you've got $18,000-$20,000 you can always buy an Autopia car. Apparently, it's full functional (but they don't go that fast). Or, there's one of the fish from the Submarine Voyage (estimated between $17,000-$20,000). I guess people will buy anything, including a set of three re-entry hand stamps, (estimated between $300-$500). In terms of "more show for the dough" --- the best deal to be had was this massive wardrobe/entertainment center from the Disneyland Hotel. I'm not in the market for an entertainment center - but this would be fun to have. And it includes a black and white copy of "The Map." Estimate for the entertainment center was $500-$700. Really? Someone would pay $700-$1000 for a piece of carpet from Walt Disney's apartment (located above the Firehouse on Main Street USA).? Not sure what the appeal would be - especially for that price. Guess there's a buyer for everything. The Van Eaton Galleries posted on-line catalogue of every item for sale at the auction, which is available for viewing here. We spent an hour at the Van Eaton Galleries. Very interesting - and, unlike Disneyland itself, no gate admission. 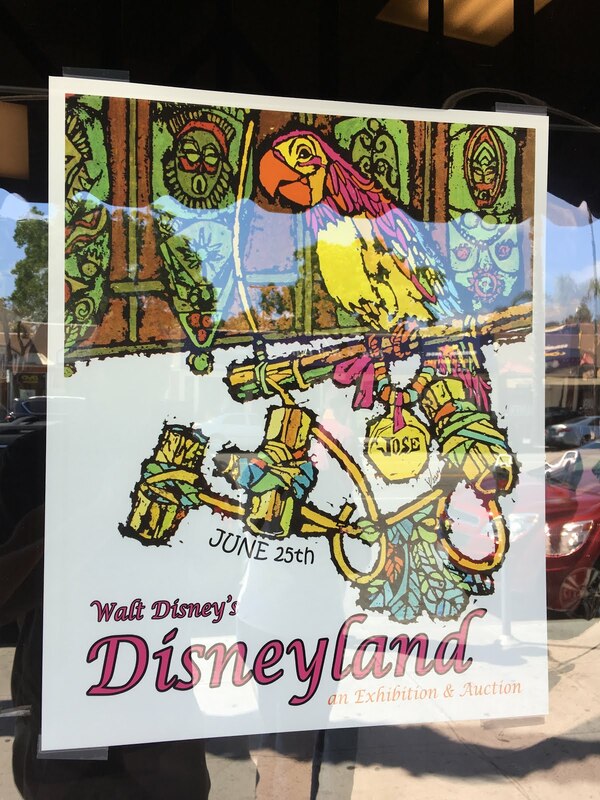 Apparently, there was 200 people at the June 25th auction, and their next Disneyland auction is schedule for sometime in 2018. For my wife and myself, whether it's a purchase for our home, or helping to meet the needs of the poor, we want to hold material wealth loosely. While we can't speak for others, as Christians we're accountable to God for how we steward our time, our talent, and our treasure. Heading back to our car, this is across the street on Ventura Blvd - with lots and lots of one story, mid-century architecture. We parked in the neighborhood on Ventura Canyon Avenue. Probably better to park on Ventura Blvd. If you park in the neighborhood, watch the signs, as there's limited parking during the week. Most of the San Fernando Valley, and much of the rest of Los Angeles, looks like this: single story mid-century single family residences. The beautiful purple flowered trees are Jacarandas, native to both Mexico and South America. The pavement on the alleyway could use some help. 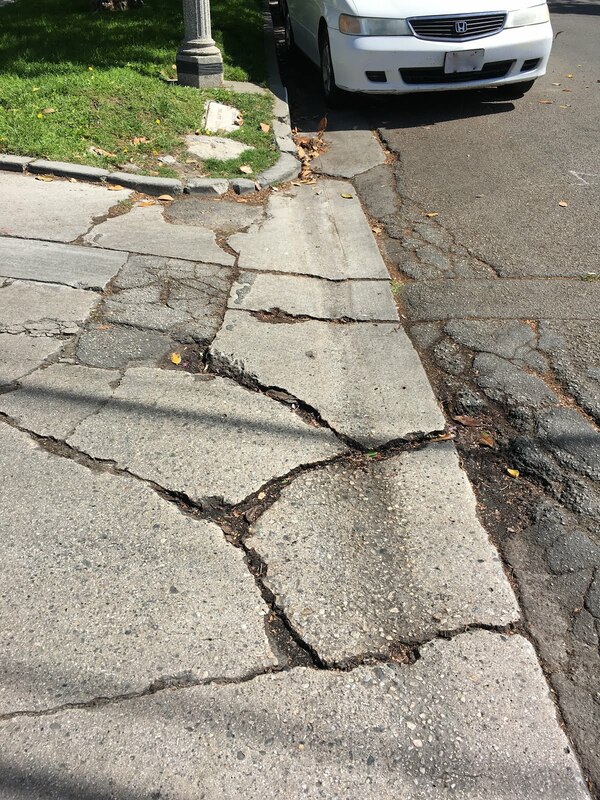 In fact, a much Los Angeles' infrastructure is in need of work - including the streets and sidewalks. Topic for another blog post. Here's a link to the Van Eaton Galleries website. First night of our vacation was in Hollywood - but first we had to drive there along Ventura Blvd. More on that next time.